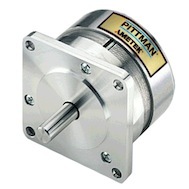 The EC057C series brushless DC motor is a high torque density model brushless motor in a NEMA 23 configuration. It is offered in 4 motor lengths with continuous torque from 0.078 - 0.28 Nm. The E30C & E30D optical incremental encoder was developed for volume OEM precision motion control applications and is the recommended encoder for the EC057C. The E30 offers a wide range of outputs, resolutions and connection solutions in a compact 30 mm by 8 mm size. The B3 power off, fail safe holding brake is a 57mm NEMA23 version designed to mount directly on the front of Pittman NEMA23 motors without adapter. Like the B49A it is designed to hold a load in position when power is removed from the motor and brake.